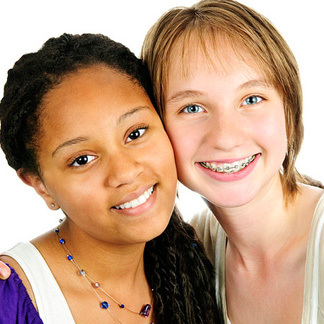 Thank you for choosing our office for your Complimentary Orthodontic Consultation. We hope your visit will be informative as well as enjoyable. The consultation will take approximately 30 minutes. Please arrive 10-15 minutes before your appointment time to fill out the Health History Form or to print and fill out the appropriate form at home and bring to your appointment click HERE. Please also bring in your insurance card. When diagnostic records are recommended, another appointment will usually be scheduled. Records are taken prior to beginning orthodontic treatment to provide us with more information that is not available at the clinical examination. These records allow Dr. Giordano or Dr. Bogle to thoroughly evaluate your orthodontic problem, formulate an individualized treatment plan and monitor your progress throughout your treatment. Panoramic image (the entire mouth) — this image is used to see all teeth that are present (including teeth that have not yet erupted into the mouth), the jaw bone, and to evaluate for possible abnormalities of the teeth or jaw. Cephalometric image (side of face X-ray) — this image is used to determine the relationship of the upper and lower jaw bones, the relationship of the teeth, and in children who are still growing, this image provides insight into future jaw growth. A fee will be charged for the diagnostic records. However, this will be credited towards the total treatment fee when treatment is started. If necessary a consultation appointment is scheduled a few weeks after diagnostic records are taken. At this meeting, Dr. Giordano or Dr. Bogle will discuss the diagnostic findings, recommendations for treatment, and the proposed treatment plan, and our office staff will review the treatment fee. The fee is determined by the complexity of treatment and the estimated time for completion. Your initial appointment to place the braces or an appliance on your teeth is approximately 60–120 minutes. After starting your treatment, we will schedule you for periodic adjustment appointments at four- to eight-week intervals which will usually take approximately 15-30 minutes assuming no broken appliances.